Winnipeg is not a destination at the top of many must-visit lists. I’ll go further and admit it’s never been on the top of mine yet I’ve been there at least a dozen times (in-laws live there), and have even visited during a few of those famously frigid winters. This summer I was back again but decided that instead of complain about the mosquitos, which have been relatively absent these past two summers, I’d actually embrace Winnipeg; get out of the house and see if “Friendly Manitoba” and this prairie city had anything interesting to offer a curious traveler and hotel lover like me. Turns out, surprise, it does! And a great starting point is the historic Fort Garry Hotel, celebrating 100 years as of December. 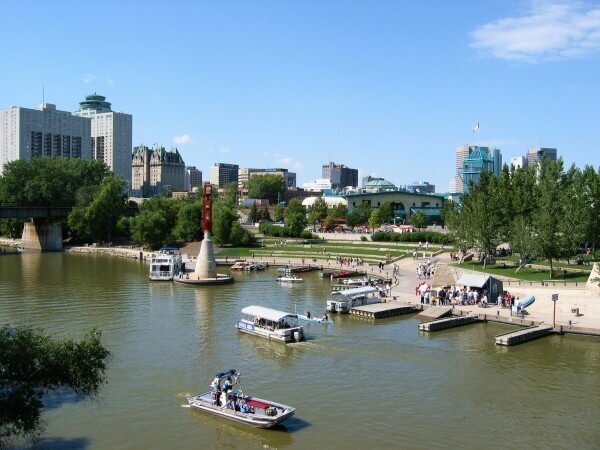 This iconic hotel is located downtown, across the street from The Forks, Winnipeg’s top tourist destination and market place situated at the confluence of the Assiniboine and Red rivers(see photo below). The Forks has been meeting place for at least 6,000 years. From early Aboriginal peoples, European fur traders, Métis buffalo hunters, to railway workers and pioneers, riverboat merchants, and thousands of immigrants, Winnipeg’s history has left its tracks on this spot. The Forks is just a few minutes walk from the Fort Garry Hotel, which has been a beacon for Winnipeg social life since opening in 1913 as a Grand Trunk Railway hotel. 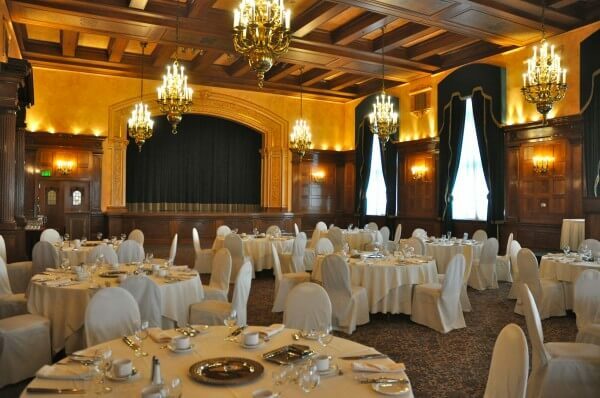 The Fort Garry Hotel has survived two world wars and two city-wide floods, and still stands as the go-to spot for Winnipeg celebrations and holds a sentimental soft spot in the collective memory of residents. “We have a lot of guests who come back and reminisce, recalling the hotel as the site of weddings, milestone birthdays, or sons or daughters grad celebrations,” said Sherraine Christopherson, director of sales. Winnipeg is a modest city so the Fort Garry Hotel feels slightly out of place —the tuxedo-clad gentleman sipping champagne at the tailgater. But like the city and the people of Winnipeg, the luxury hotel is not at all stuffy or standoffish. The owner’s two giant dogs (easy to mistake for lions) roam the lobby at times, and Christopherson, who has been at the hotel for 18 years, says guests and staff are like family. The Fort Garry Hotel is loaded with history too, from the original clock in the lobby to the ghosts that frighten late night staffers. The dining room is top notch and frequently caters special events in the hotel and around the city. Four grand ballrooms teem with revelry each weekend, while the Palm Room lounge invites a relaxed and elegant atmosphere and live jazz on Friday evenings. The 246 rooms and 16 suites definitely have that been-around-awhile feel, with high ceilings, crown moldings, creeky floors, and some with seriously unfortunate wall paper and carpet choices. But Christopherson tells me they are in the process of upgrading the decor, removing the overly embellished walls and adding luxury linens and modern accents. But the Fort Garry Hotel’s pièce de resistance—the Ten Spa (insert exultant music here). Sprawling across the entire 10th floor of the hotel, this perched pampering paradise is THE NICEST and most cutting edge hotel spa I have ever been to. Hands. Down. In Winnipeg? Yep! Of course there is the standard menu of drool inducing head-to-toe treatments for men and women—facials, pedicures, massages—administered by highly trained and professional attendants, but it’s the hamam, or Turkish Bath, that really sets this place apart. It’s Winnipeg’s only world-class spa and the only co-ed Turkish bath in Canada, making it popular destination for couples. Guests are given lockers, robes and slippers at arrival and if visiting the hamam, are asked to don a pestemal, a fringed Turkish cotton cloth. Therapists greet guests and show them to a warm room where treatments begin with Moroccan mint and sweet Turkish Delight. The hamam itself i a 1001-Arabian-Nights oasis of heated blue mosaic tile seats and walls, a celestial ceiling and soothing music. The only thing missing is a magic carpet and three wishes from a genie’s lamp, one of which would certainly be spent on a return trip here. 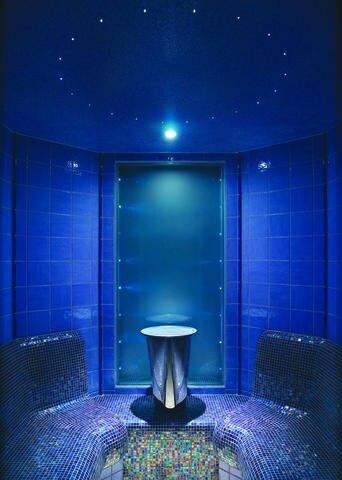 There are several hamam treatments to choose from that sport names like Hamam 101+ and Hamam Fully Loaded. All you need to know is this—rose oil massage and a salt scrub gommage (exfoliation) on a heated slab of marble. Enough said. It’s called the Ten Spa because of its location but could also be so named for its place on a scale of 1 to 5 spa experiences. 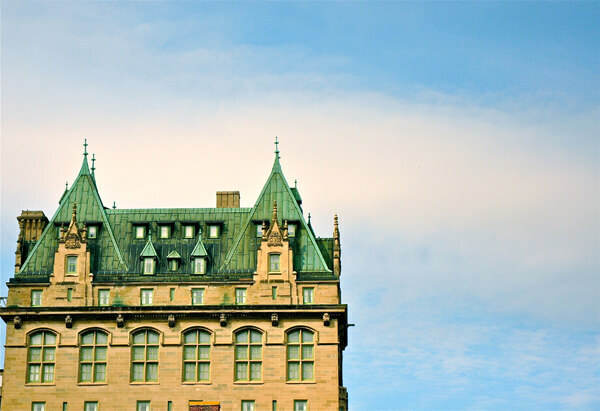 Like many things in Winnipeg, the Fort Garry Hotel and the Ten Spa were a pleasant surprise. Rates: From $159 Canadian. There are several spa/yoga package deals on the website. Check directly with the hotel for special centennial celebration rates beginning in December. Good To Know: Currently the hotel charges for wi-fi (boo-hiss); the spa should be booked well in advance of your stay; there’s a 24-hour onsite deli with diner-like banquets and a microwave for late night popcorn; the railway station is just down the street. Kimberley Lovato is a freelance writer based in San Francisco who has, no surprise, spent a fair amount of time in Winnipeg. 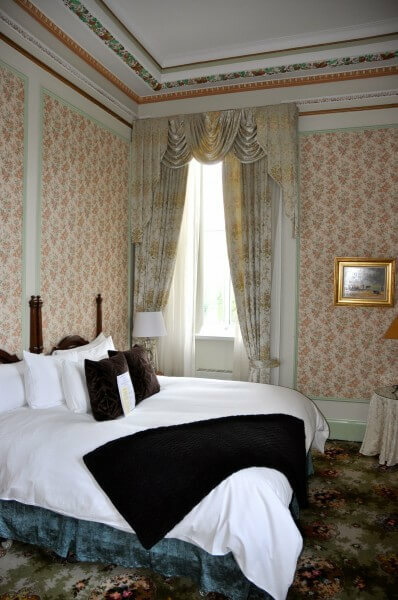 Great review for Fort Garry Hotel. Been living in Winnipeg for ages but never had the chance to try Ten Spa, and this time I have to check it myself. Thank you for this great review.